RGB monitors generally use a “professional-grade” tube with a high line count, resulting in an extremely sharp picture! Most were used as either TV studio monitors, security monitors or medical/scientific equipment. These devices were extremely high-end and used to cost anywhere between $2000 and $35,000. They still go for a lot on eBay (usually between $100 and $1000) and cost a lot to ship. Pictures can not do it justice: the difference was absolutely staggering. 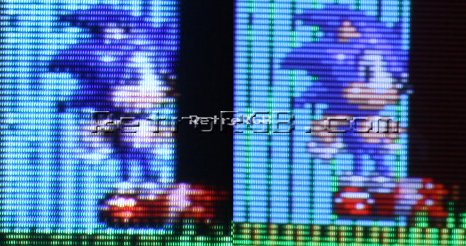 Seeing an RGB monitor side-by-side with my high-quality Sony CRT absolutely blew my mind. After experiencing that, I feel that unless you don’t have the room for it, every retro-gamer should own an RGB monitor. They support every type of accessory a standard CRT supports, such as light guns and 3D glasses (both the Famicom and Sega Master System offered some cool 3D games). I wish I had a way other than pictures to show you how much better using an RGB monitor is than any other solution (maybe some day I can borrow high-end video recording equipment and do a side-by-side video). The only reasons not to get one are if you really have no space at all for a monitor, but there are tricks for that too; I put mine on a rolling cart so I can put it away when I’m not using it. Sony, Ikegami, NEC and Mitsubishi made some great Professional Video Montiors (PVM) and all will be a great choice for 240p and 480i content. There are also some Broadcast Video Monitors (BVM), as well as a few PVM’s that support 480p and higher! These are great for 6th generation consoles and up that support multiple resolutions. Just a quick FYI – Many 480p compatible RGB monitors will display “480i” on the on-screen display when it’s actually showing a 240p signal. I’m not sure why, but at least on my monitors, the signal has definitely been displayed as 240p. – Many of these were left on 24/7 in some sort of professional environment. As a result, you can find monitors that are extremely worn out and produce a horrible, blurry picture. As long as you try it out before you buy it, you should be able to avoid getting a worn-out monitor. – The newer the better. They made PVM’s into the 2000’s, so always try to look for the newest one. Also, some older PVM’s require different input adapters (I talk more about that later), so a newer monitor with BNC inputs would be a better choice. Please head to the Display RGB page for more info on how to get an RGB signal on your display. If you’re here as part of the RGB Guide, please either move onto the next section: converters, or move along to getting your SCART RGB cable into your display.